I recently attended Who Do You Think You Are - Live in Birmingham's NEC (National Exhibition Centre). There were a host of exhibitors there, many from Ireland, but one of the most eye-catching was the "booth" run by Forces War Records - they had a whole airplane on their stand!! 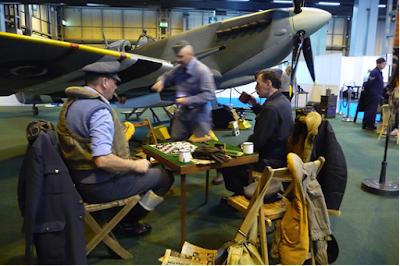 This was a very special attraction – a replica World War Two Spitfire, complete with its own ground crew and WW2 props. Forces War Records had joined the Lytham St Anne’s Spitfire Display Team to celebrate the show’s 10th Anniversary at the NEC in Birmingham. People were given the opportunity to climb aboard and have their photo taken inside the cockpit of the iconic aircraft, as well as a chance to chat to the Spitfire Crew, who were in costume and character throughout the three days. Forces War Records’ team of military and genealogy specialists were kept very busy, both inside and outside the replica RAF hut, giving research advice on everything from the movements of POWs and the history of the RAF, to medal recognition and handwriting and document deciphering. They also ran demonstrations of their website’s features and carried out quick name searches for visitors, to see if we held records for their relatives on the database. 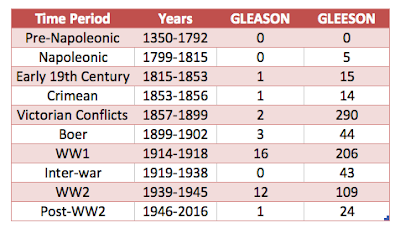 I did a search on their website and was surprised to turn up 35 entries for GLEASON and 729 for GLEESON. That's a lot of Gleeson's! And there were probably a lot more with alternative spelling variants like Glazen (spelt like how it is pronounced in some parts of Tipperary). 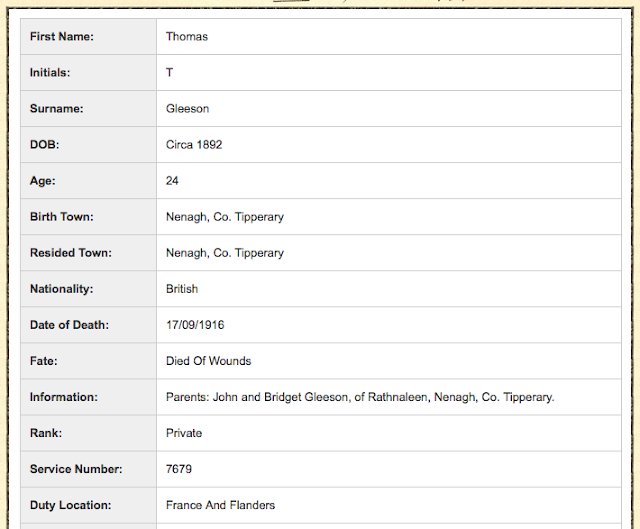 The great thing is that a lot of these records are freely accessible so it is well worth your while checking them out to see if one of your Gleeson relatives appears here. A lot of the records do not have a huge amount of genealogical information other than the soldier's name & regiment, but there are useful historical notes on the regiments to which they belonged. The World War 1 records are particularly apt given that this year we commemorate the Battle of the Somme where over 1,000,000 men died, including 3500 Irish soldiers, many from the 36th Ulster Division and the 16th Irish Division. Here for example is Thomas Gleeson of Nenagh, who died from his wounds on 17th Sep 1916. For conspicuous gallantry when under heavy rifle and machine-gun fire. He left his trench to bring in a wounded man lying within 10 yards of the enemy entanglement. 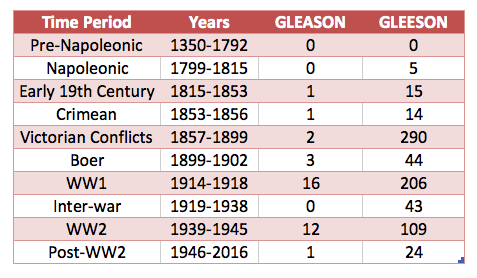 If your Gleeson relative served in World War One, why not explore these records and write up an account of his time there. We would be very happy to post it on this blog in his memory. Thanks Maurice, very interesting, I would love to go to WDYTYA Live. One of those who received the gallantry awards (Military Medal) is my grand uncle Pte. Richard Gleeson 11481 from Paulstown, Co Kilkenny. Sadly Richard and his brother John both lost their lives in the war. Richard was killed in action at Ploegsteert and is buried in Steenwerck in northern France, I visited his grave most recently 2 weeks ago during a short trip to the Yprès Salient area. John was wounded and repatriated to hospital in London where he died & is buried in Brookwood, Surrey.